Fungus is more than just mushrooms. It's a Fungus Among Us shows off big and small fungi that do everything from consume jet fuel to creating actual zombies! In It's a Fungus Among Us, you'll meet the wild group of organisms that can turn ants into zombies and eat trillions of pounds of feces every day. They're not all gross though, these are the same types of organisms that make cheese stretchy, add sour tastes to candy, and make bread rise! We're talking about fungus! Different kinds of fungi do incredible things; did you know that in future they may even help save the environment because they can eat plastics in landfills, and jet fuel from ocean crash sites. 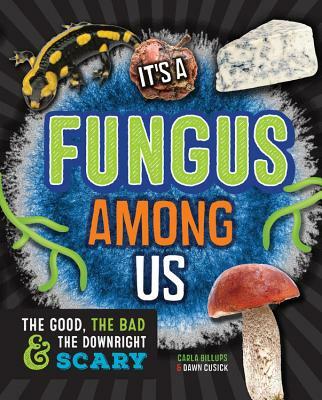 When you read It's a Fungus Among Us, you'll learn about outdoor adventures, kitchen experiments, and get an introduction to Humungous Fungus, a 38-acre fungus with an ice cream named after it that holds the record for the world's largest organism. Feast your eyes on hundreds of full-color photos, check out activities and experiments, and learn all kinds of wild and wacky information from these unique organisms. Carla Billups has more than 27 years of teaching experience in elementary and middle-school grades, where she developed a passion for teaching science. Currently she is a STEM coach working with fourth and fifth grade teachers and is part of the science faculty for the Mickelson ExxonMobil Teachers Academy. She has served on the Outstanding Science Trade Book Committee for the National Science Teachers Association. Dawn Cusick has authored a dozen nonfiction children's books that have won national and international awards from the Animal Behavior Society, the National Science Teachers Association, the Children's Book Council's Children's Choice competition, and more. Her books have been profiled on NPR and Yahoo News. She teaches biology at Haywood Community College in western North Carolina. "A detailed, readable compilation of facts about fungi....There’s an incredible amount of material covered here, and it is unlikely that many libraries own comparable titles....Both a solid research tool and an enjoyable read..."